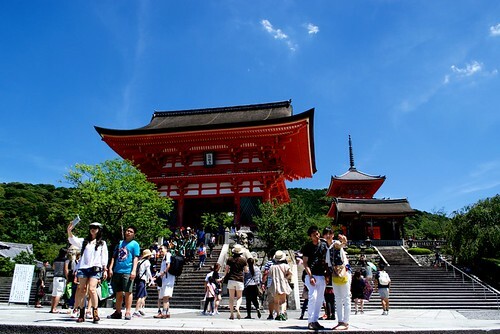 One of the mainstream tourists spots that you can’t avoid to visit while you’re in Kyoto, is Kiyomizudera temple, in Higashiyama district. Specially for photography addicts. 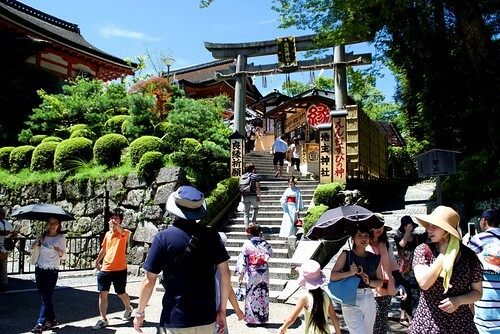 Wander around the streets of Higashiyama towards Kiyomizudera temple, and take your time to delight your senses and camera skills during the visit. Kiyomizudera temple main hall with views of Kyoto. 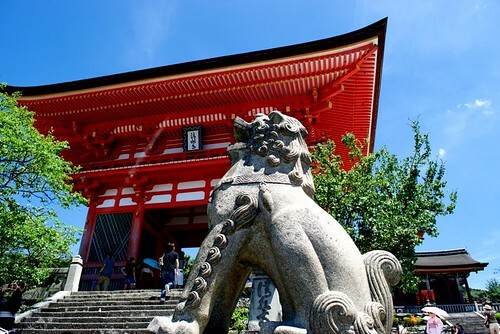 From Kyoto station, take the bus number 100 or 206 and drop off at Kiyomizu-michi stop. From there, only thing left is to walk, just need to follow the signs and people going uphill. 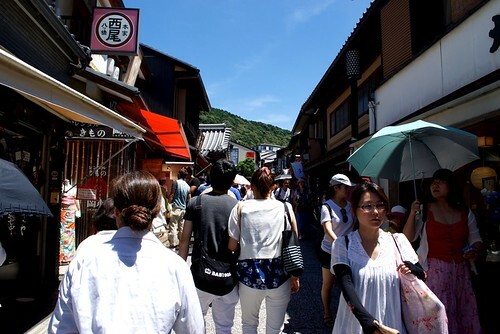 It might be a bit tiring, or even exhausting on a hot summer day to walk around Higashiyama on the way to Kiyomizudera. Can take around 10 to 20 minutes uphill, depending on your pace and the number of tourists wandering around the streets. Leave the shopping for your way back after the visit, as it is most probably you’ll take the same way. Matsubara street towards Kiyomizudera, Kyoto. Kiyomizudera temple complex entrance, Kyoto. Komainu guardian to Kiyomizudera temple complex, Kyoto. 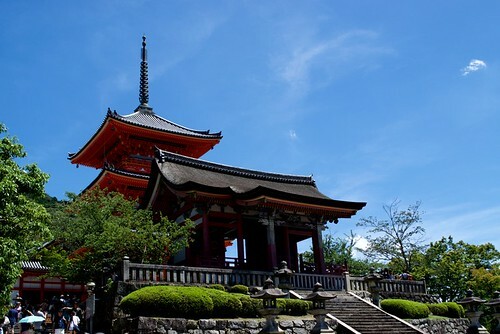 As of 2016 and coming years, Kiyomizudera temple has been under many renovation stages. Because it is being done step by step, the impact on the visit is not as troublesome as it seems. Still, don’t be surprised if one of the buildings is covered, under renovation. The name could be literally translated as “pure water temple” probably in honor to the Otowa waterfall running through the complex. 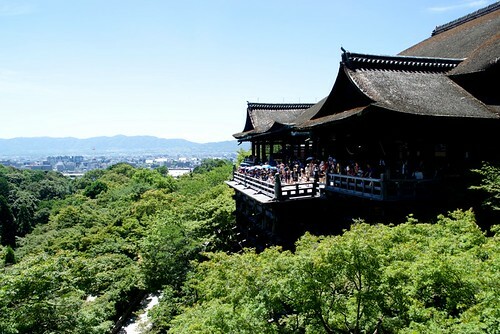 Amazing fact from Kiyomizudera main hall, is that it was built having used any nails. Housing inside the hall a small statue of Kannon. Views of Otowa waterfall from Kiyomizudera, Kyoto. 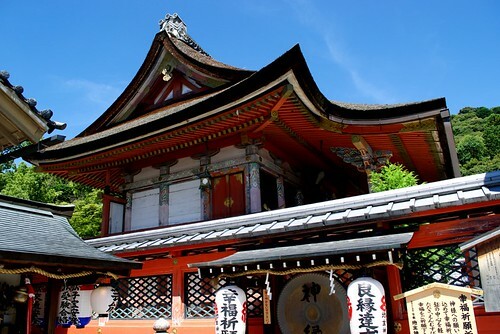 The shintoist shrine in Kiyomizudera complex. Dedicated to love and matchmaking. 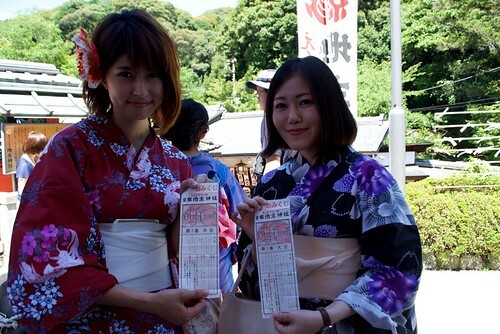 It is possible to pass a trial in front of Jishu shrine, to know your love fortune. 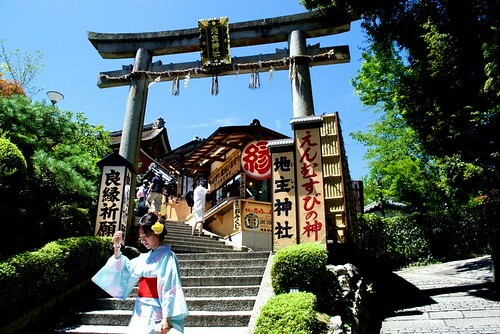 To walk with your eyes shut, the distance between the two rocks in front of the shrine. Succeed, and your love luck is granted. Or that’s what legend says. Path to Jishu shrine in Kiyomizudera, Kyoto. 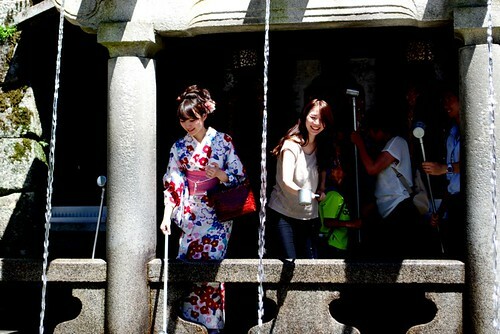 Lady in kimono washing her hands before praying at Jishu shrine. 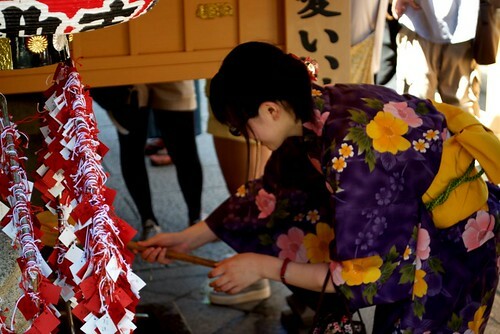 Drawing omikuji, fortune telling, is a must do in japanese shrines. 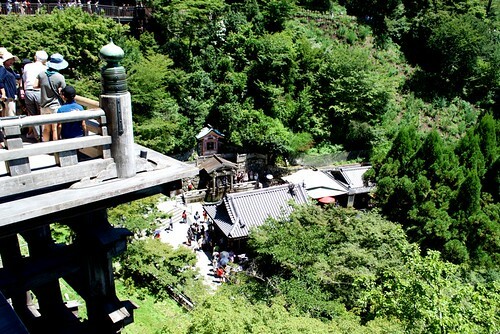 Jishu shrine in Kiyomizudera temple complex, Kyoto. 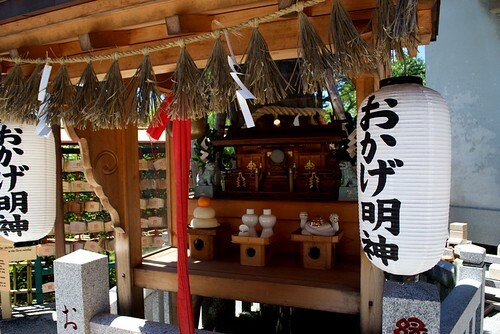 Small altar next to Jishu shrine. 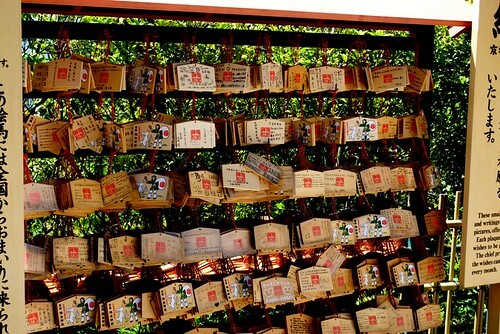 Emma plaques to write your wishes at Shinto shrines like Jishu shrine. 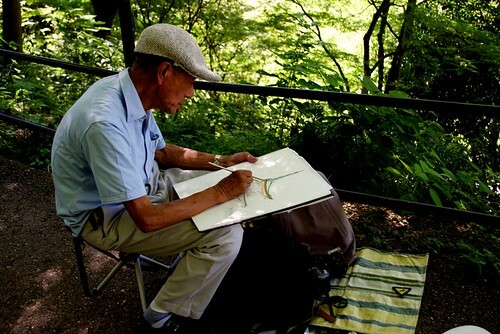 Many people practice their abilities drawing Kiyomizudera temple. Tea house in Kiyomizudera, Kyoto. The purest of all waters. The line to a get a sip of one of the streams might seem convenient, as you can pick one of three. Far from convenience, each stream has a different benefit. Longevity, good grades at school or college and love luck. It is not written which stream has which benefit, it all depends on your luck. Otowa waterfall in Kiyomizudera, Kyoto. 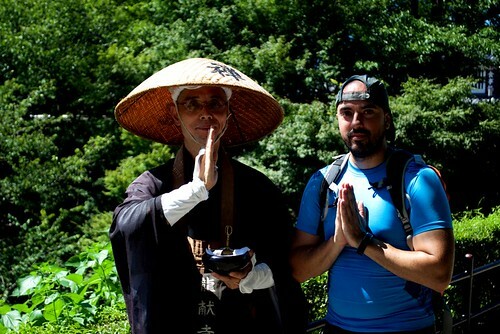 Being blessed by a monk on his pilgrimage around Japan. 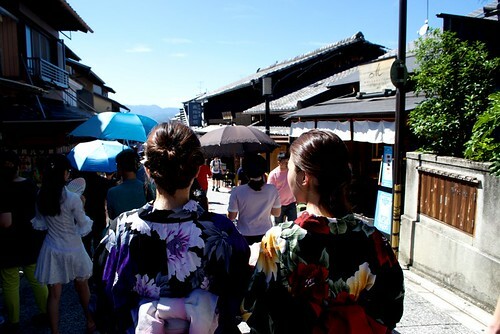 After the visit to Kiyomizudera, is time to wander around the streets of Higashiyama. 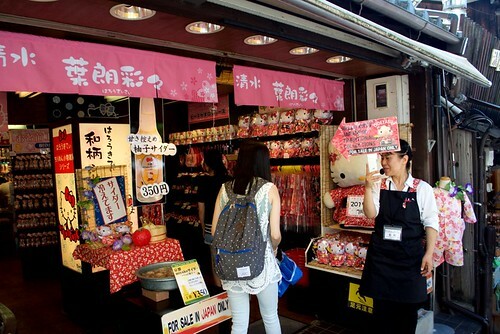 Restaurants, souvenir shops and japanese crafts on the way down to the next stop. 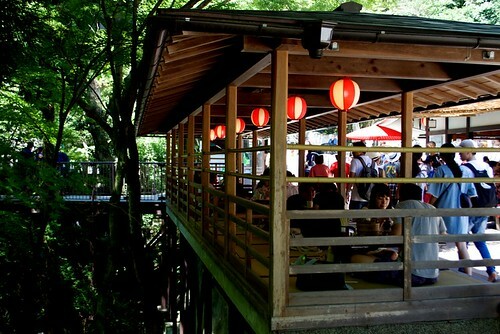 My recommendation after Kiyomizudera, head to visit Yasaka shrine and Gion district. Kakigori, shaved flavoured ice to beat the summer heat. Japanese crafts in the shops of Higashiyama district, Kyoto. 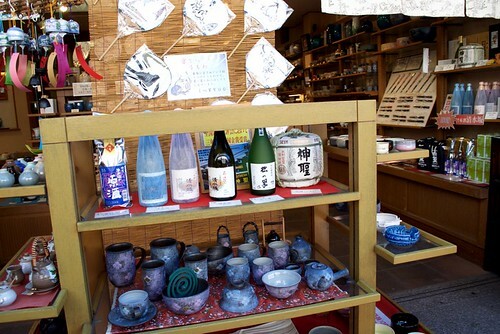 Japanese crafts and souvenirs in the shops of Higashiyama district, Kyoto. Going back down from Kiyomizudera temple, following the streets of Higashiyama district, Kyoto. Path to Jishu shrine in Kiyomizudera temple complex, Kyoto.